Project 971 Щука-Б (Shchuka-B, 'Shchuka' meaning pike, NATO reporting name "Akula"), is a nuclear-powered attack submarine (SSN) first deployed by the Soviet Navy in 1986. Akula ("shark") is also the Soviet designation of the ballistic missile submarine class designated by NATO as the Typhoon class submarine. The distinctive "bulb" or "can" seen on top of the Akula's rudder houses its towed sonar array, when retracted. All Akulas are armed with four 533 mm torpedo tubes which can use Type 53 torpedoes or the SS-N-15 Starfish missile, and four 650 mm torpedo tubes which can use Type 65 torpedoes or the SS-N-16 Stallion missile. These torpedo tubes are arranged in two rows of four tubes each. Improved Akulas and Akula IIs have an additional six 533 mm torpedo tubes mounted externally, however it is unclear whether these are fully functional external tubes, or if they are only capable of launching Mines and decoys. The external tubes are mounted outside the pressure hull in one row, above the 'Normal' Torpedo tubes, and can only be reloaded in port or with the assistance of a submarine tender. The 650 mm tubes can be fitted with liners to use the 533 mm weaponry. The submarine is also able to use its torpedo tubes to deploy mines. This kit is simplicity in itself. It has nine parts plus a base and two of the parts are optional so when you get around to building it, there will be seven bits. 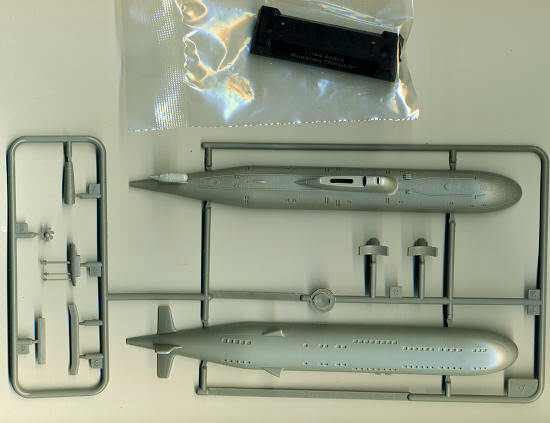 The optional parts are for a conning tower with the periscopes and antenna raised or lowered, and the diving planes extended or retracted. The hull in split horizontally to accommodate the installation of the diving planes. A small display base with the sub's class already painted on it is included. Decals include common data markings. The builder will need to paint the white waterline. Molding on the sub is quite good and this has to be very much a weekend build including painting. It may take a day or two longer for taking care of the seam and masking to paint the white waterline, but regardless, this should be a build that any age group old enough to know what glue is for to handle. An easy build of an interesting Russian submarine. Recommended for all ages.